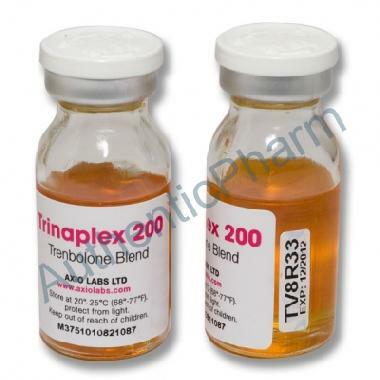 Trinaplex E 200 for intramuscular injection contains trenbolone acetate, trenbolone hexahydrobenzylcarbonate and trenbolone enanthate. The presence of the acetate ester allows Trinaplex E 200 to display a rapid initial physiological response. The hexahydrobenzylcarbonate and enanthate esters, which release at slower rates, prolong the physiological response with a relatively flat absorption curve over the duation of the injection life-cycle. Bodybuilders have been known to use the drug in order to increase body mass more effectively than by weight training alone. A normal bodybuilding dosage can range from 200 mg/week up to 1400 mg/week.